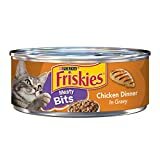 Friskies meaty bits cat food lets you delight your cat’s senses with bite-sized, moist chunks with real chicken served in a flavorful gravy. 100% complete and balanced for growth of kittens and maintenance of adult cats. 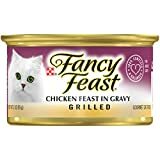 Friskies cat food meaty bits senior with lamb & rice in gravy, 5.5-ounce cans (pack of 24) has delectable flavors and enticing textures come together in a delightful dinner specially made for your senior cat.